We've recently been inspired by Eric Carle's 'I See A Song', a beautiful picture book that transports the reader on a magical musical journey. A violinist introduces himself at the beginning of the book & explains; "I see a song. I paint music. I hear colour"
As you start to read, the black & white illustrations of the violinist fade, & Eric Carle's wonderful artwork transports you through a colourful masterpiece. I managed to find a copy of this book on Amazon, & Minnie loves studying the illustrations & describing which shapes & objects she sees on each page. Inspired by the book we listened to a selection of classical music tracks to see if we could hear colour. 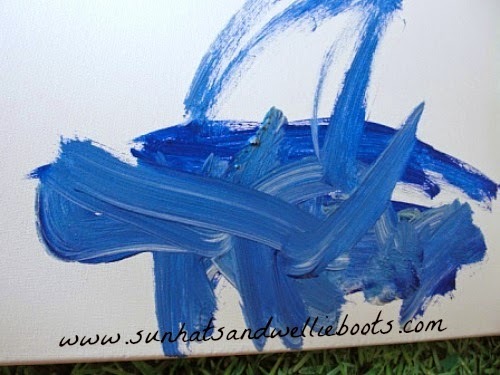 Minnie is currently fascinated by the ocean, & as soon as she saw a large art canvas she wanted to paint the sea! 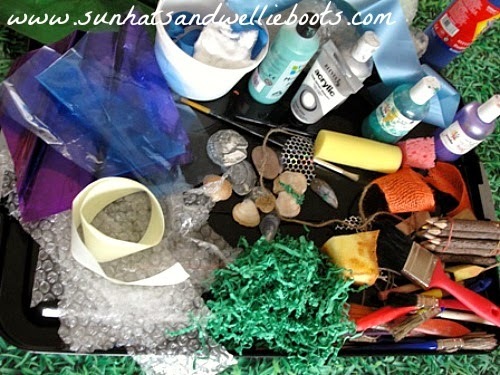 We collected our paint & a selection of materials, I added an old plastic food tray (that I picked up in a secondhand store) which was ideal for her to use with the different sized painting tools. We selected our music Anitra's Dance from Peer Gynt Suite No.1 by Grieg & Minnie started to create! 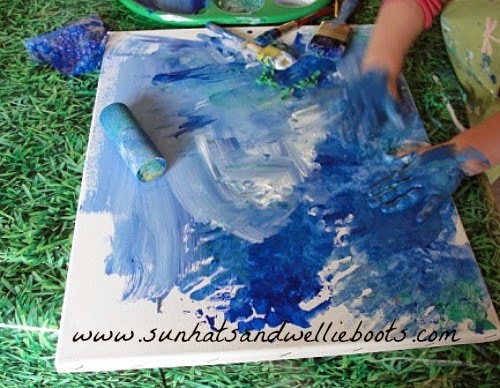 She started painting with brushes, then with her hands, bubble wrap, & soon explored the other items. 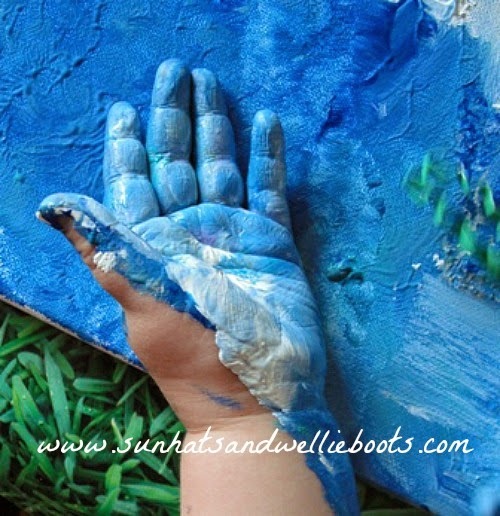 As she painted she named each paint colour to herself, & briefly described what she was painting. 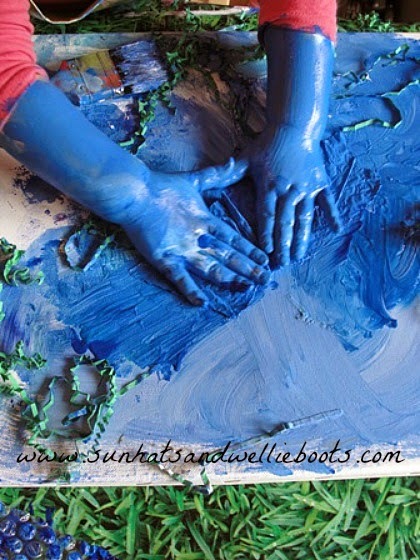 She filled a big paintbrush with blue paint & shouted; "Deep blue sea, deep blue sea!" 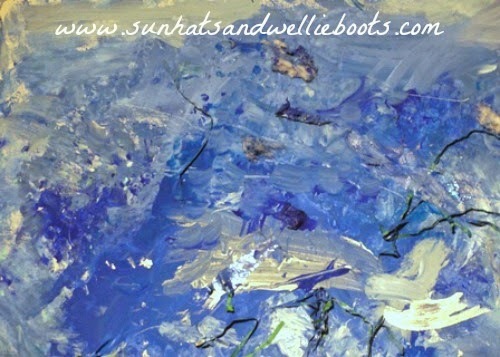 In this video clip you can hear her painting "Blue sky... a big blue sky!" ﻿The gauze & bubble wrap produced some great effects. 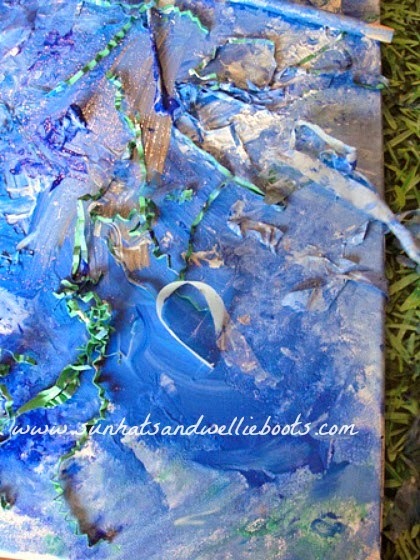 ﻿Minnie clearly enjoyed exploring the texture of the paints, as you can see! In case you're wondering, those are not blue gloves!! It was fascinating to observe her movements as she painted in time to the music with the roller & brushes. As certain parts of the music grew louder, Minnie smacked the paint on the canvas & as the music grew softer, her fingers swirled & blended the paint. 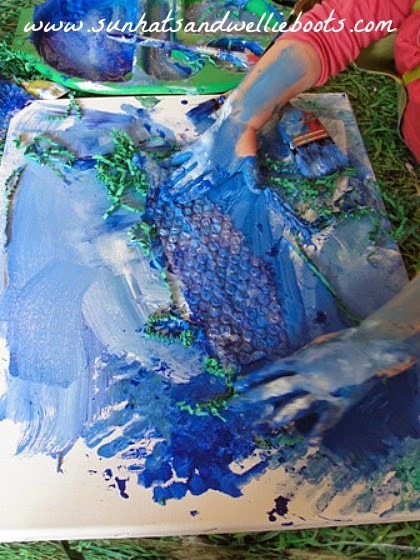 ﻿ The last clip shows Minnie adding her green paper 'seaweed' to the painting. 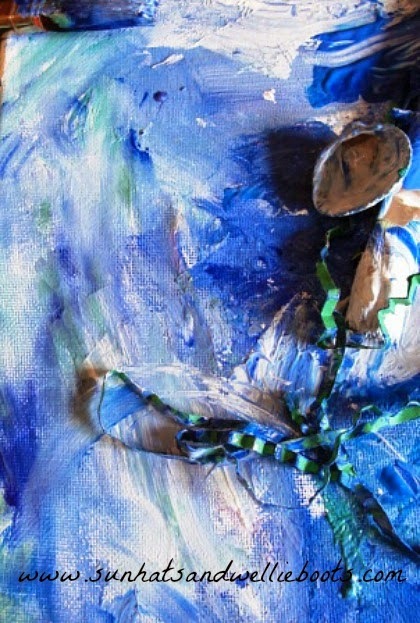 Her high pitch voice almost seems to be singing along with the music as she sprinkles her seaweed over the canvas. 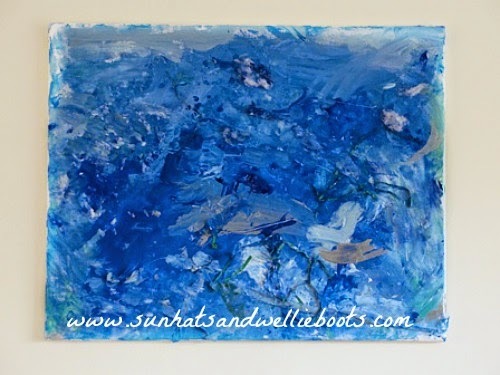 Some seaweed remained on the canvas, but she removed most of it before adding some cotton wool, coloured cellophane & ripped pieces of tissue paper to her sea. 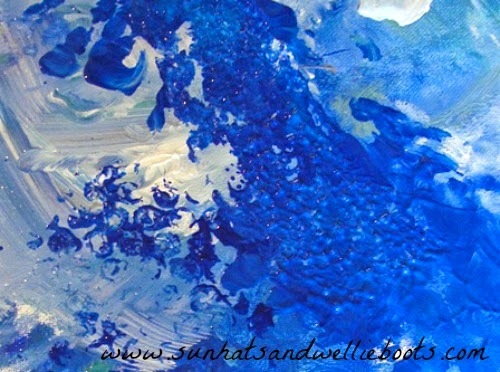 This gave a new dimension to her creation, & it became a multimedia work of art. When she had finished, we set the canvas aside to dry. As it was drying Minnie placed a few pebbles (that she had collected from a recent visit to the beach) by the canvas. It was lovely to see natural objects from the beach being added alongside her ocean artwork. Can you hear the music of the sea? I love the movement in the painting. 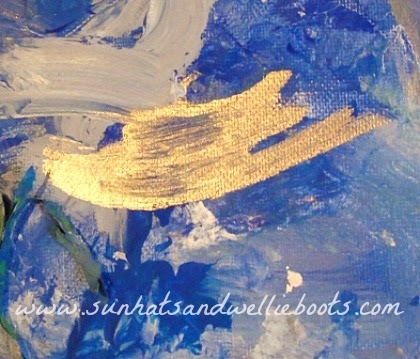 What could this beautiful brushstroke be? 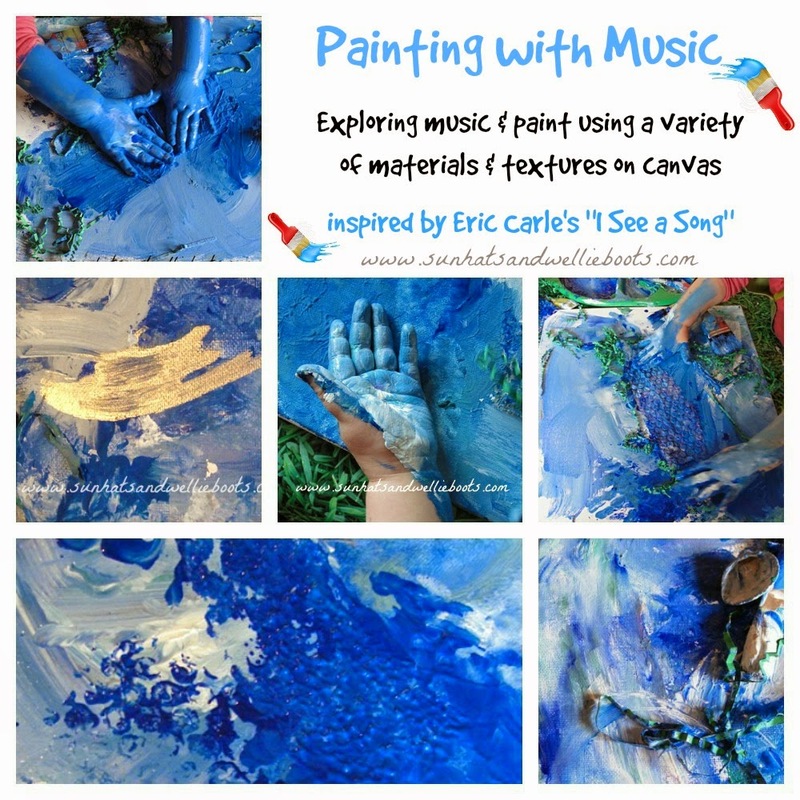 It was wonderful to observe Minnie's creativity, expression, & sensory exploration as she explored the canvas alongside the music, it just made my heart sing! And I think the finished picture is pretty beautiful too!